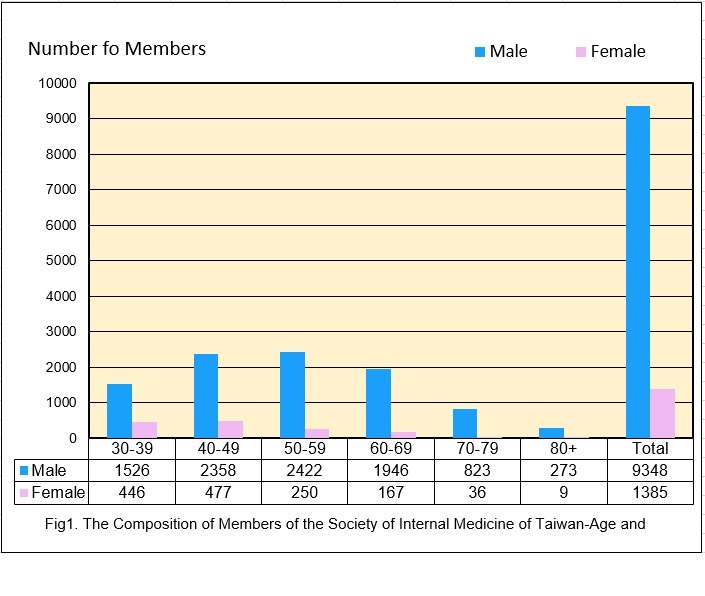 "Taiwan Society of Internal Medicine" was founded on the 13th of June 1987. Its main purpose is to raise the quality of internal medicine, including clinical research and practice of internal medicine, public health and with international academic exchanges. The membership has increased from 984 at the initiation to 9,169 at present. There are 2,468 members (26.92%) with the age of 30-39, 2,561 members (27.93%) with the age of 40-49 and 2,423 members (26.43%) with the age of 50-59. Therefore, 82.13% of current members of this Society are aged between 30 to 59. There are 8,168 male members (89.08%) and 1,001 female members (10.92%) in the Society (Fig. 1). During the course of 25 years since its inception, the number of members has seen an increment of 7,912. 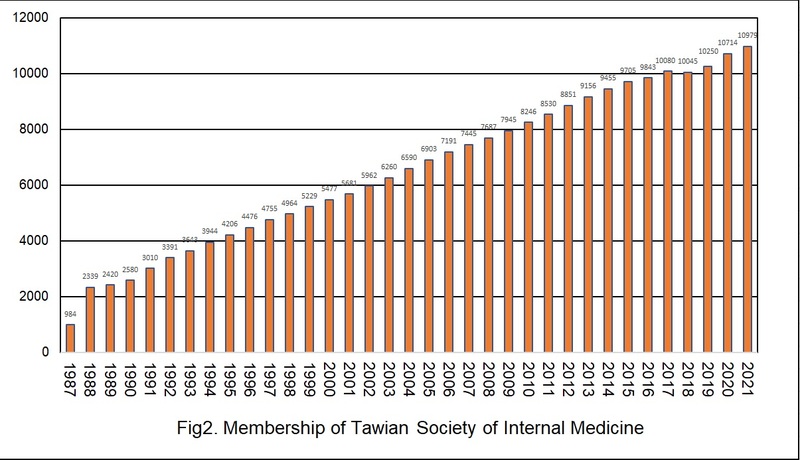 After the year 2000, an average of 302 specialists in internal medicine had joined our Society each year, and such rapid growth makes society the biggest medical organization in Taiwan (Fig. 2). In addition, the Society of Internal Medicine also dedicates itself to the continued education of its members, the introduction of digitized management system, improvement in quality and efficiency of healthcare, the promotion of medical ethics in doctors' practice of medicine, and the organization of various international conferences to encourage international exchanges.